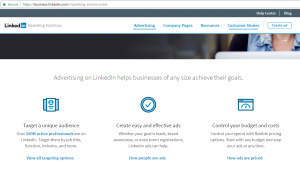 Now we have the background, and a better idea of why LinkedIn is an essential component of your online advertising strategy, let’s take a quick look at just how to build your ad campaign. This is where we use the background information we went over in Part One. You’ll first be prompted to name your ad, and to choose a target language. Remember, the ad title must be 50 characters or less, including spaces. At the bottom right of each step, you’ll see a blue ‘Next’ button; go ahead and click that now to proceed to Step 2. In the second step, you create the meat of your ad – you’ll write a title, write some short copy, and decide if the CTA should take the viewer to your LinkedIn page or to your website. You’ll also choose the layout of your ad – the way it will appear on LinkedIn to the viewer. Use the section at the right, offering Square, Tall, Horizontal, or Long shapes to decide your ad’s appearance. Two points to remember here – the title must be 25 characters or less, and the ad copy is limited to 75 characters. Again, this includes the spaces. While you are parsing your audience, it’s important to point out that you don’t have to limit yourself to one group. 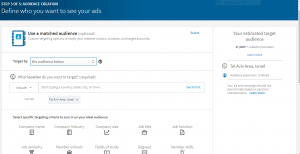 LinkedIn allows you to create multiple ads in each campaign, a strong feature that you can use to your advantage. Setting up a campaign with several ads gives you the opportunity to aim each ad at a slightly different audience. Take another look at the demographic categories above; you can set up one ad to reach senior females in the marketing profession, and another to reach senior males in the IT department. Each group will need different ad copy (Step 2), and will respond differently to your pitch. In addition, you can set two or more ads for each demographic that you want, and use them for A/B testing. 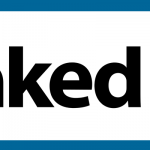 LinkedIn allows you to monitor your campaign performance after the ads are live, and if you see that one ad is not performing while another is generating results, you can cancel the weak ad and focus your budget on the strong one. 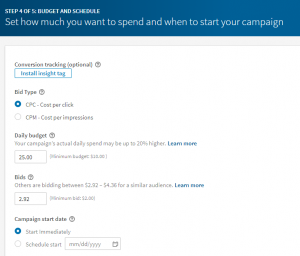 You can choose two basic methods of budgeting your ads: the Cost per Click (CPC) or the Cost per Impression (CPM). CPC is the more common option, and it’s the easiest to set – just enter a bid price on this, and the more your bid exceeds the minimum, the more likely your ad is to be seen in the first place. This is the option to choose if you know that your ads generate a high volume of clicks. Cost per impression, the other main option, is a set price for every 1000 people who see your ad. If you know that you have a high volume of impressions, with very few clicks, this is the way to go. Again, the goal here is to maximize the clicks you get for your advertising budget. The most important point to remember here is that LinkedIn ad campaigns do not come cheap: it is more expensive to advertise on LinkedIn than on Google PPC or Facebook. The added value lies in the stronger audience targeting tools, the more narrowly tailored ads, and the greater control that you have over ad placement, timing, targeting, and budgeting. And that is LinkedIn advertising in a nutshell. 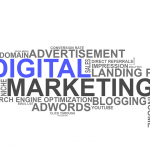 It’s a big nutshell, because there’s a lot to it, but BlueJay Marketing Boutique can work with you on the process of creating, placing, and monitoring your ads.